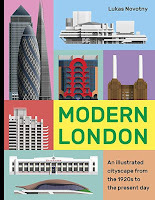 A wonderfully exuberant and unique look at the skyline of London over the last hundred years. Artist Lukas Novotny used Illustrator software to create the images which actually turn out to be better than photographs. All the buildings are front on which would be difficult to photograph in many cases and the weather could also make changes to a building's color. The illustrations are remarkably precise with shadows to create a dimensional feel and lettering on some buildings is included, Underground stations have the London Transport logo. I was aware though that the pictures sort of float on the page because there is no ground included, if there was a suggestion of a pavement with some street furniture I think it would really complete the images. The ten chapters all open with a beautiful montage of each decade's buildings and this is followed by a structure a page with some copy about the architect, location and interesting background material, for example: One Canada Square at Canary Wharf was so big it blocked out the TV signal for 100,000 residents who lived in the surrounding area, the BBC built a relay station just for them. It's not only well known architects and their prestige buildings that are included, on page thirty-six there are two prefabs from 1945, they were very modern for their time and housed thousands of Londoners after the war (some are still standing, too). 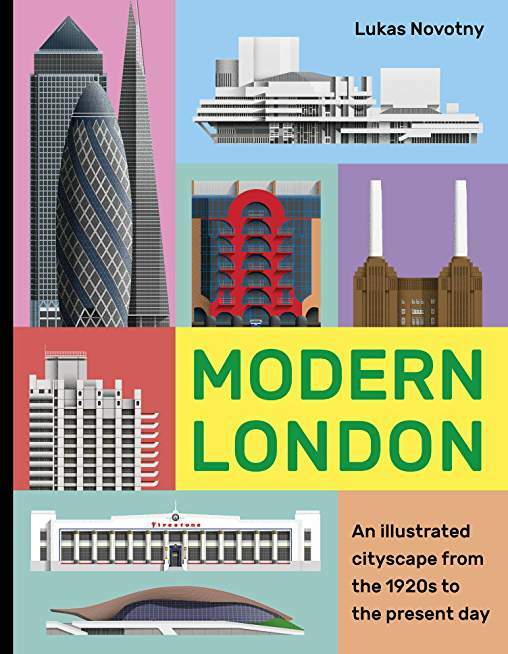 Office buildings rather than housing predominate throughout the book which would explain why architects like Wells Coates, Maxwell Fry and Berthold Lubbetkin, who all designed very modern apartments in the thirties, aren't included. A nice touch are pictures of period examples of transport and street furniture like Gilbert Scott's red telephone box or right up to date the very successful Legible London wayfinding system. Lots of examples of public transport like a tram, trolleybus and buses that evolved over the decades into the latest version the Wrightbus Routemaster. Ten helicopters make an appearance including four operated by the Metropolitan Police. All of these illustrations are as meticulous as the buildings though obviously a lot smaller on each page. I think it's worth saying that the book is full of architecture but it's aimed at the general reader rather than students or professionals. Where to next for a similar book of lovely illustrations, for my money it has to New York or Chicago, both cities would benefit from the Novotny style. 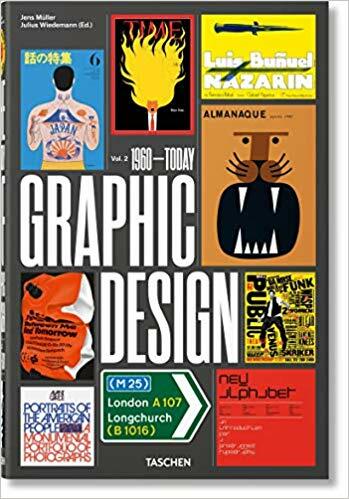 At last, the second volume to Taschen's in-depth look at graphic design. This edition covers the years from 1960 to 2017 with 3500 images (2500 in volume one) and the format is the same as the first book. Each decade has a brief introduction then an illustrated timeline spread followed by the graphics. The range of material is wide, obviously all kinds of printed material but also paper currency, stamps, film credits, packaging, logos, signage, and a feature I particularly liked: spreads devoted to a single subject, mostly this is designers from around the world with samples of their work but also, for example, city branding, pc icons, early web pages, 3D logos, there are seventy-eight of these single item spreads. This book covers the introduction of computer design software and there's an obvious shift from the early nineties onwards with graphics revealing a much more fluid look as designers could do anything they liked with just a few keystrokes. The previous hundred years or so of design discipline created by the limitations of process work and printing evaporated remarkably quickly so that now, visually, anything goes. The two volumes tip the scales at eight kilos with a big page size of thirty-seven centimetres by twenty-four, beautifully laid out and printed on a reasonable matt art. Two books with six thousand illustrations, it's a remarkably creative look.